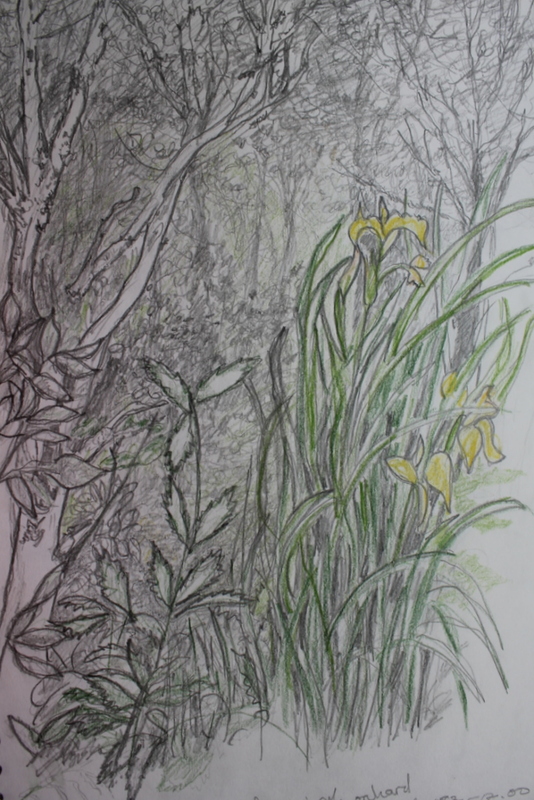 These drawings were done, as suggested, in conte chalk pastel and charcoal-monchrome and coloured studies drawn quickly capturing contrast and tone. 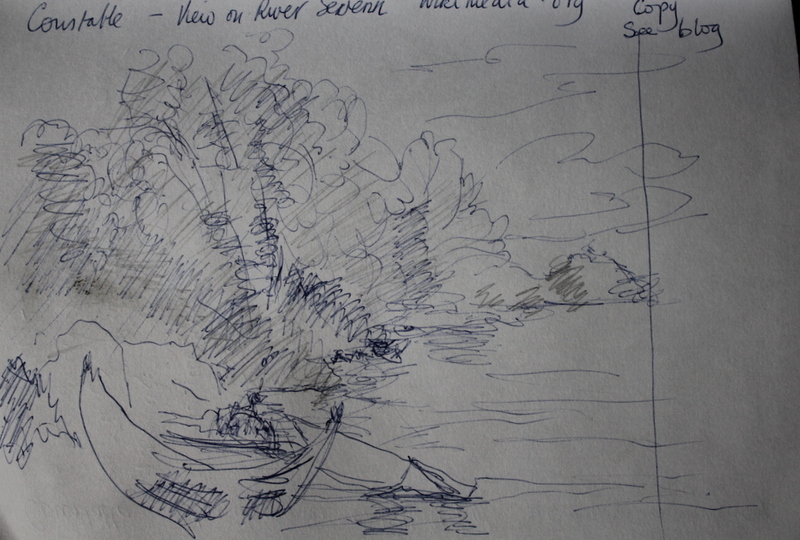 The first set of drawings were done before I found Constable’s sketch book drawings from the V&A museum(see below) the subsequent set with Constable in mind. Drawn in Conte and black charcoal and worked back into with putty rubber. Drawn with red chalk, and black charcoal. I like the movement in this sky. I chose to draw this picture in portrait as the sky grew in tone intensity from horizon and then calmed in tonal intensity as it went away from the earth. 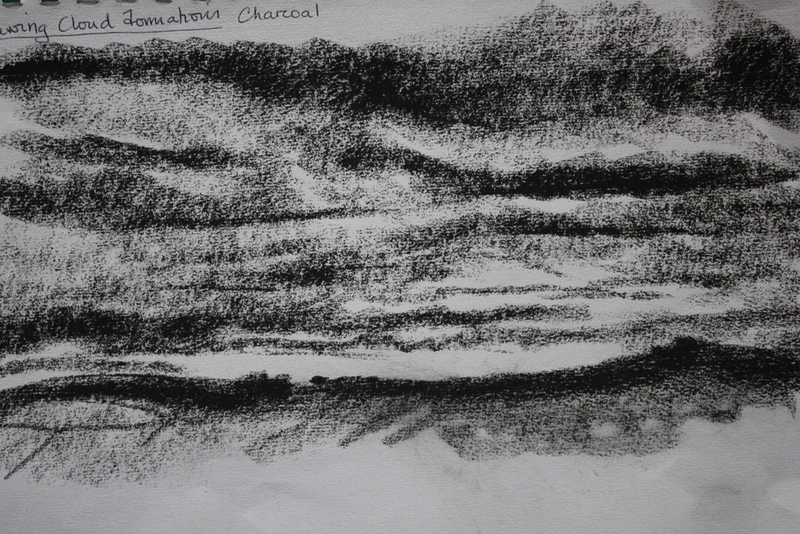 Charcoal was a good medium for these dramatic tones. 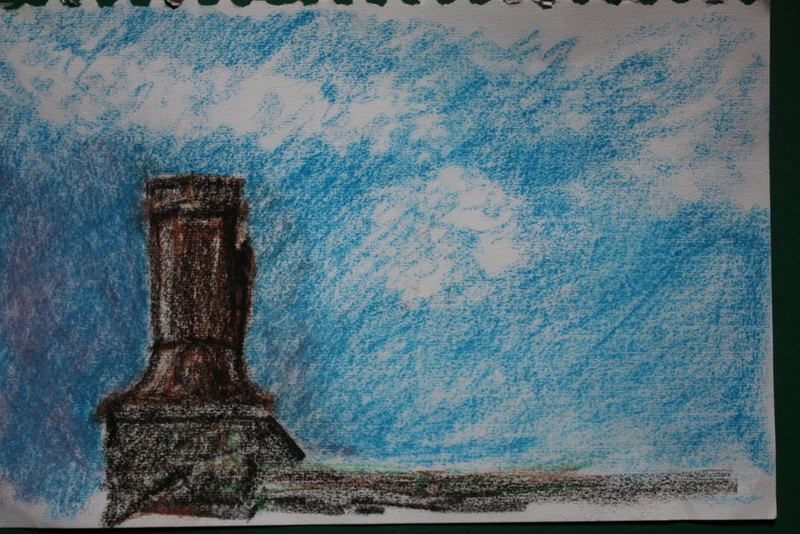 The sky to the left of the chimney pot had a hint of lilac in it and the clouds were small and white and transparent. Ihad problems with the mixing of the chalks . This sky had no distinct clouds but a transparent total layer of fne cloud which reflected different colours in different parts of the sky. It was drawn in coloured chalk pencils and oil pastel with some charcoal. I do not like the sketchy nature of the chalk which meant the colours were difficult to blend one into the other. Design for an illustration to Gray’s ‘Elegy’, Stanza III. Constables drawing is divided into two parts -the sky in grey wash leaves the moon free of tone and sweeps across the page with horizontal lighter clouds overlaid with darker heavy stroke of loaded brush. 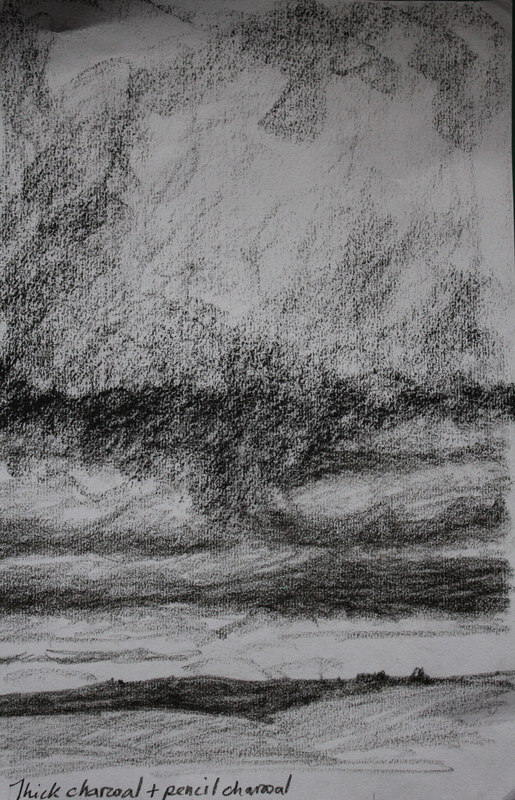 In front of this he resorts to charcoal in order to produce an even darker and harder applied area to denote the foreground trees which rise in a looming composition. Constable in (what appears to be) one medium here, his sky is light with short hatchings in a variety of directions, the hatchings being both closer and heavier where the dark clouds start to develop. His more distant clouds are but squiggley lines on the white of the paper. The foreground is also hatched in heavier closer lines and the middle ground drawn in mid tone blocks or left as white paper. There are a few diagonal lines emanating from the sky which by virtue of their distance apart I would think represent beams of light through the clouds onto the whilte patches of field. When viewed fro m a distance this light on the white of the field in the middle ground is very prominent. After looking at this I realize how much my clouds/skies are drawn in block shading and feel I should try again in hatching. Artist (if known) (Year) Title of image, or a description in italics. [material] [online image]. Place: Gallery holding original work (if known). Available from: URL [Accessed date]. Better in hatching , better with increased tonal pressure in the foreground-view point less advantageous to that of Constable’s but overall image better. Constable has a lot in his image despite it being entirely clear what it is. I still don’t feel Ive got the clouds right, Constable’s clouds have themselves a sense of perspective –how has he achieved that? -it seems the nearer clouds are in the upper part of his drawing, are larger and greater in tone and definition -those further away, in the lower part of the sky have much less shading and consist in many places just of light pencil squiggles. 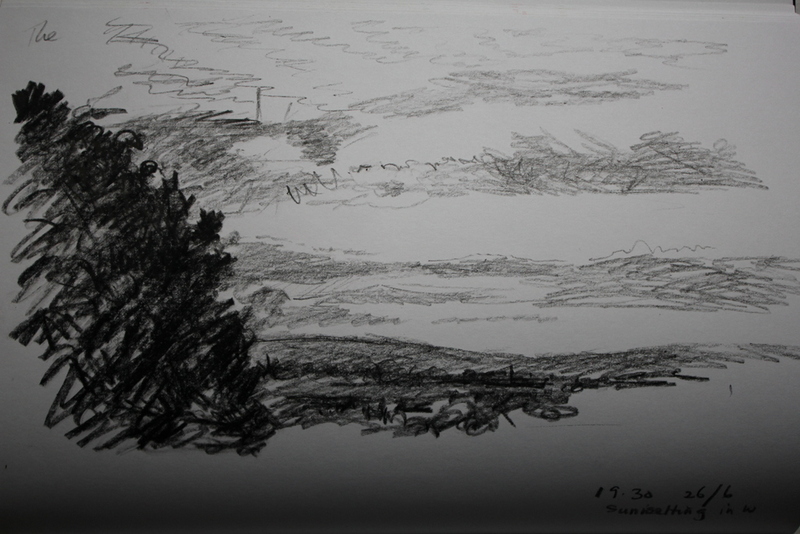 I have drawn in black conte, which appears to be thicker than that used by Constable and hence less able to give definition. This fine sketch appears to have used a staining ? 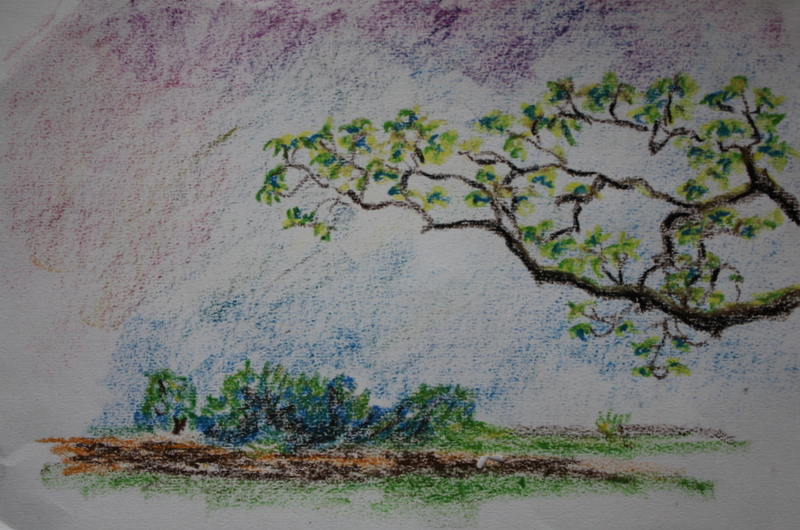 by watercolour under the pencil skecth to give tone to the land and parts of the sky. 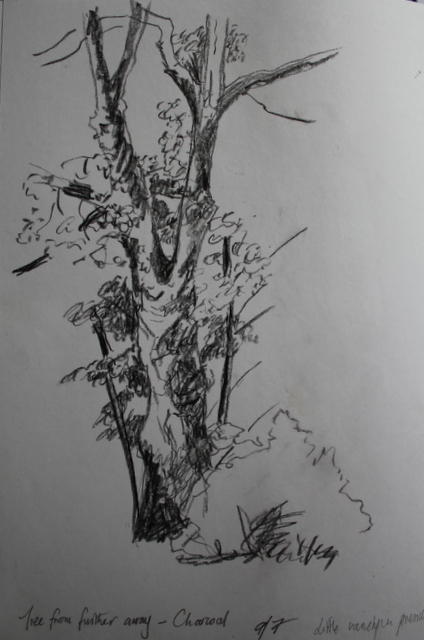 The pencil touch is very light, with cross hatching in the trees, small lines to represent clouds and foreground and closer but lightly applied pencil work in the mid ground. I selected this image in order to look more closely at Constable’s use of cross hatching -the near foreground has dark diagonal hatching which becomes softer in the near field leaving patches without shade and areas demarcated by curved flowing lines. 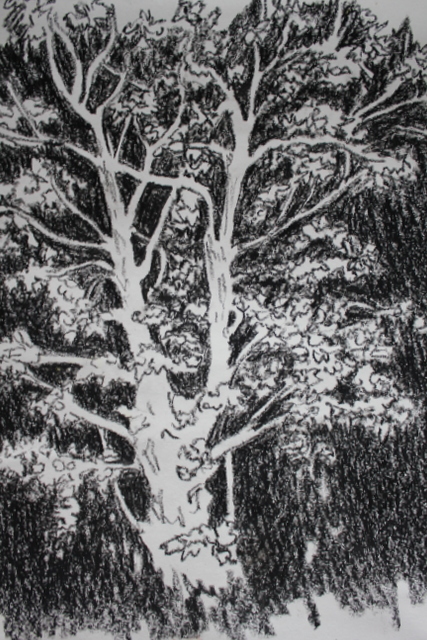 The trees in the mid ground are darkly crosshatched -squiggles, even, with the mid tree having hatching which is soft thicker and almost light block shading. The cloud hatching is light and sparse diagonal and horizontal and the outline of clouds are marked in places by a soft line. The distant horizon is drawn with soft line and the distant hills with shading which appears to consist of a few horizontal lines. 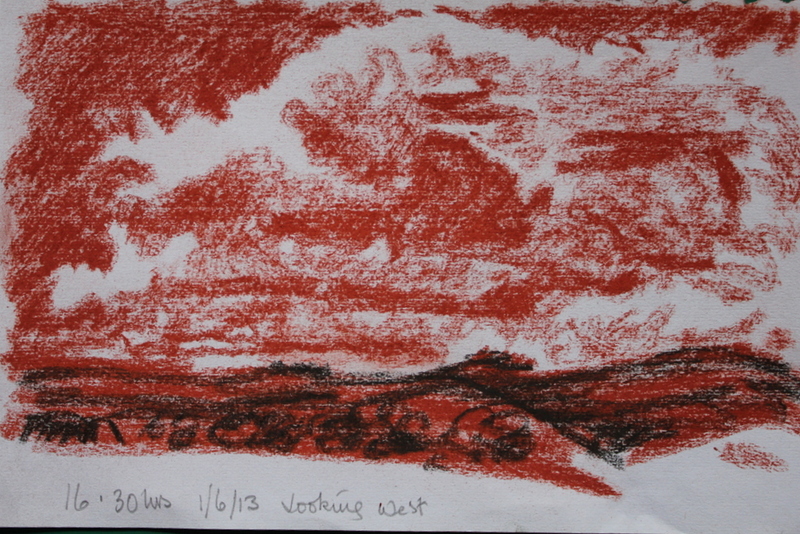 Having printerd a few of Constables sketches above, I took them outside to draw the distant view of Pendle Hill–the wind was blowing light rain was falling (June 30th 14:00hrs) and the technicalities of using chalk pastel or charcoal with no fineness to the tip and the environement lead to me getting very annoyed with the attempt. 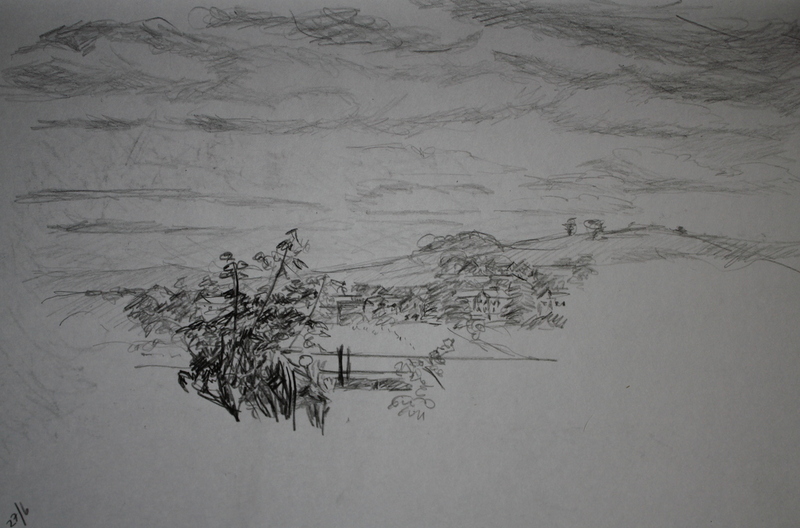 Constable’s sketches are light and finely controlled, mine are by comparison violent and clumsy. I don’t think he used chalk pastel or charcoal but fine or soft pencil in these sketches which gives much more control. 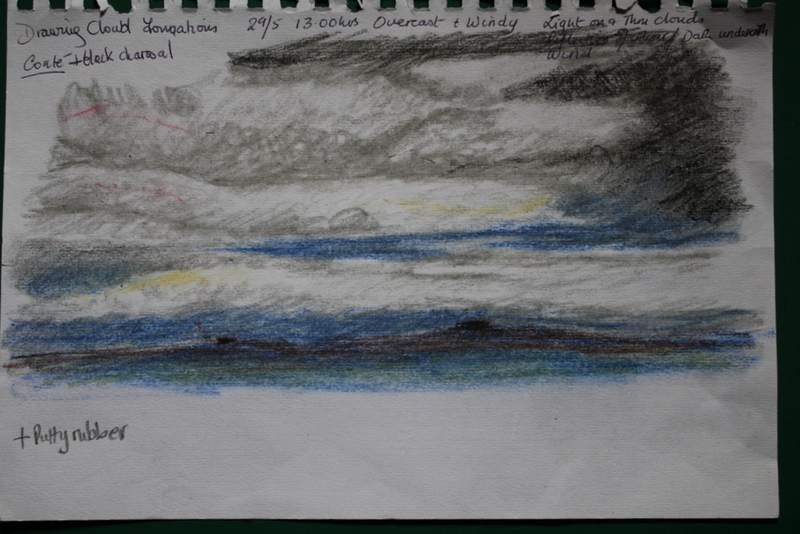 drawn in light Conte –light wo=ind 11:30 27/6 –clouds were difficult as there seemed to be no division between them. 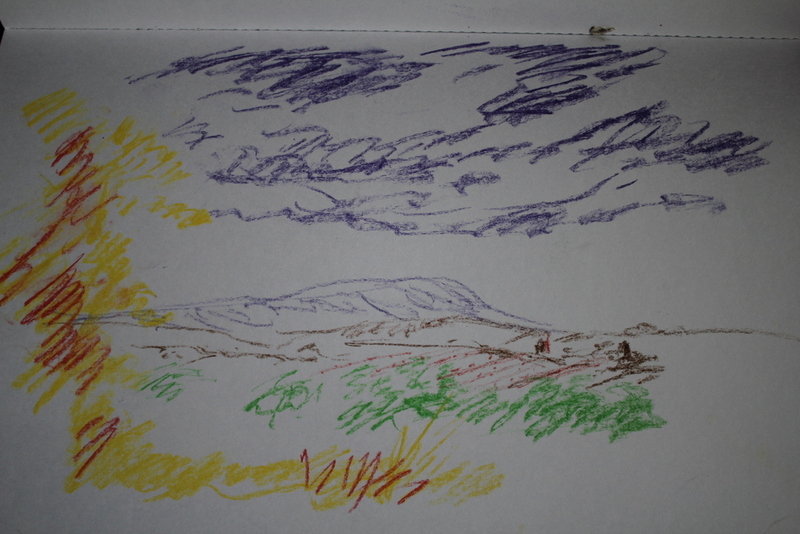 View of Pendle Hill drawn in chalk pastel-in attempting to keep a lightness of touch as Constable seems to use, a hint of distant landscape and fine lines for clouds this picture has turned out “pathetic” –the clouds are too heavy in pressure and far darker than the hill and the use of colour confused the tonal contrasts. 2. 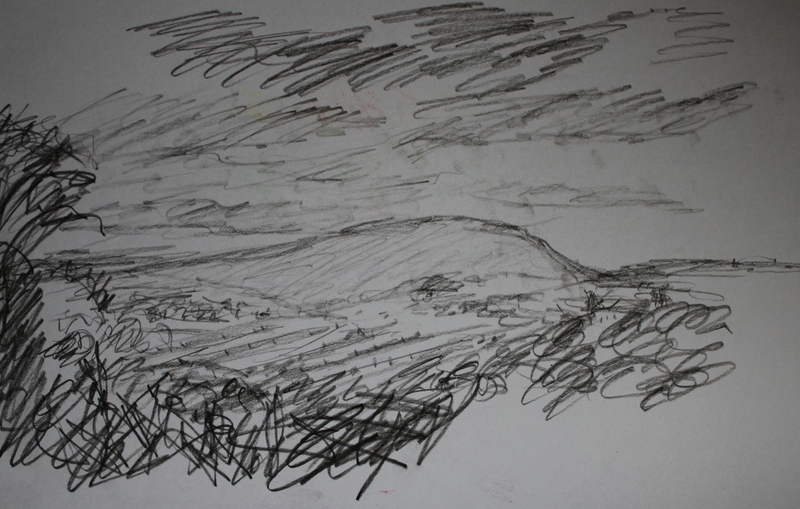 View of Pendle Hill drawn in pencil charcoal-once again the sky was drawn in too heavy a tone and so worked back into in putty rubber. It is better than the above picture but the hatching is untidy—In excuse, I was influenced by the weather and the papers flying every where. 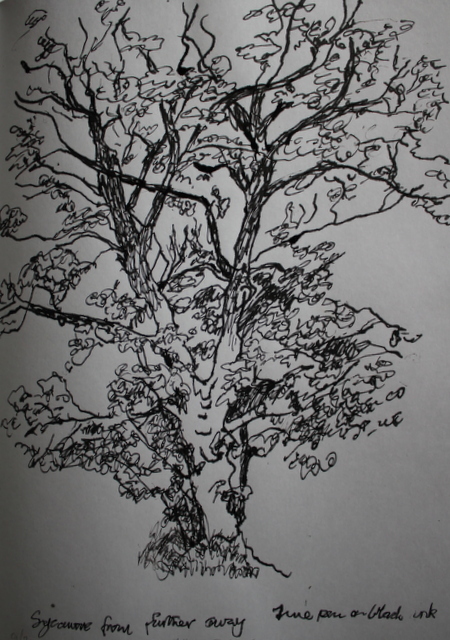 How can I use the drawings in the two books “Vitamin D ” and “Drawing Now” to inspire me in drawing trees? 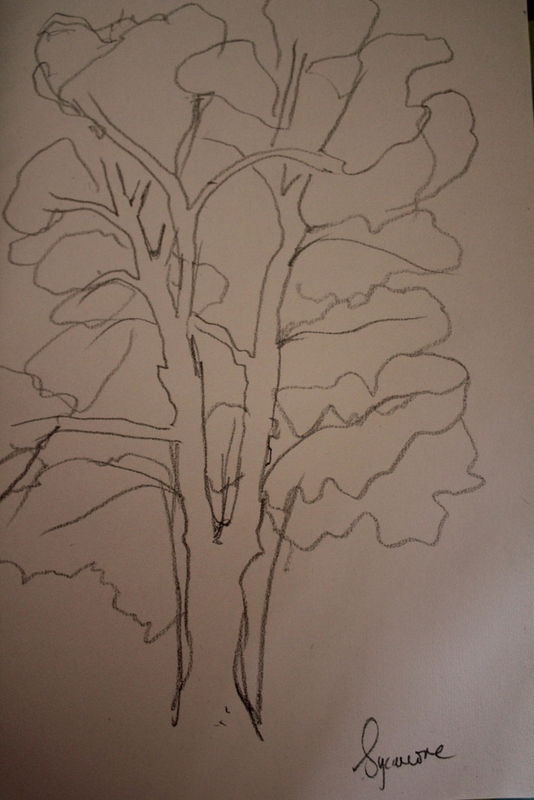 A tree is to be a figurative drawing is it not? an exercise in observation and the use of certain materials? and yet the images in these books have been abstracted and distrorted by thoughts and feelings. The thoughts that come to mind are the relationship between the branches of the tree and the blood vessels or bronchi, the destruction of the tree by man’s need to produce fields and factories, the tree as a life that stands well beyond our measued years, a tree as history, and yet does not move from the same spot or communicate (a tree cannot produce art), it has sensory systems which detect light and water and food, what are its motor systems? its means of changing itself or its world around? It slowly permeates as it grows in response to the nutrients it gains by the action of its sensory systems, it loses its leaves as direct reflex to cold and lack of light–is this art? sensation producing output but without the control or manipulation of a higher centre-no will. Art needs the higher centres. 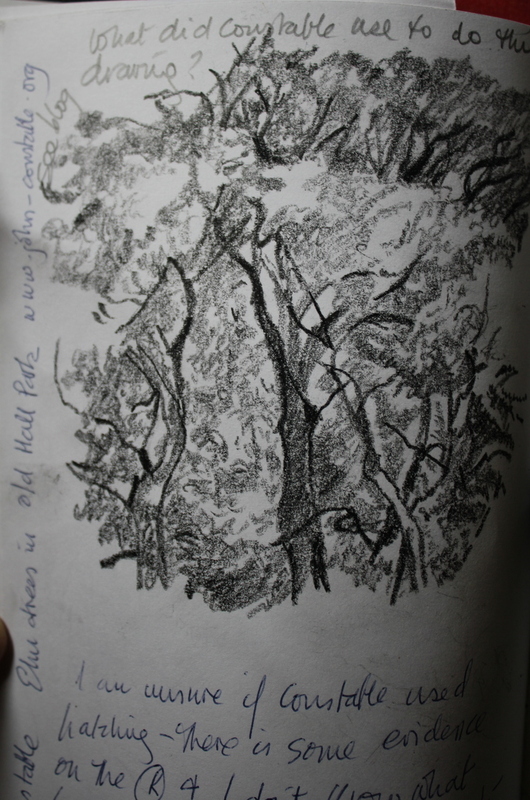 I copied this drawing in pencil and biro -merely as a means of following the manner in which Constable had dealt with the trees, which were representated by areas of hatching in several directions mainly diagonally and horizontally and varied in the intensity of pressure and the size of the line. I’m not sure of the nature of his drawing implement, but mush softer than biro and hard pencil. 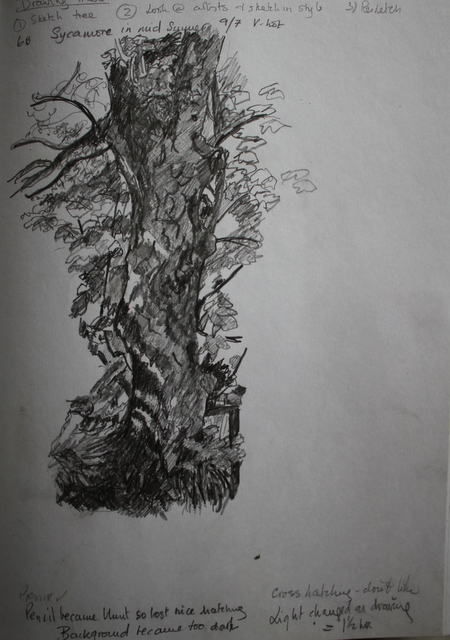 I enlarged an area of this tree to try to work out how Constable had approached the drawing-see below–It wasn’t obvious if he had used cross hatching in the tree -although there were some very light areas which could have been cross hatched. It wasn’t clear what implement he used although I trust it was a soft fine tipped pencil to account for the degree of detail. I used a conte crayon which was too thick and it proved very difficult to maintain concentration for the amount of work in the foliage. and what of this beautiful delicate and intricately observed Lemon tree by Frederick Lord Leighton , each leaf represented in full either in strong or fine line,areas between the leaves “filled in” with lines of twigs and branches, no cross hatching but soft block shading with light falling on the branches. 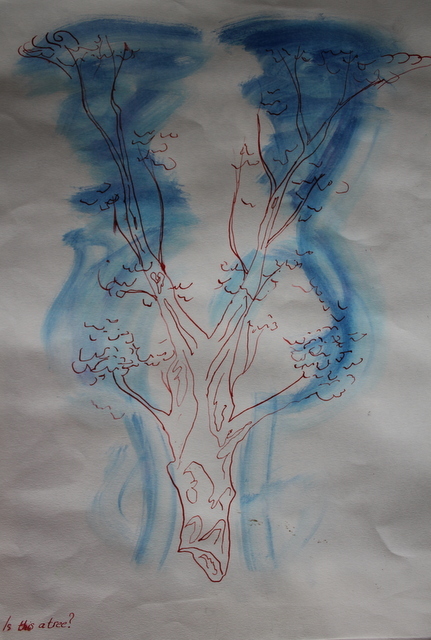 The tree is beautiful in its delicacy and able to stand alone as in the representation by its very quiet presence. I love leaves that produce a lace-like and fine effect as in the drawing by Lord Leighton above. Why is lace attractive? Why am I drawn to the fine lines and small areas of light against dark, the softness, the feel of light breeze through the leaves as the sun filters to the ground. The small shadows which move with the swaying, rustling play of the leaves. The sun filtering through and dappling the shadows with light. 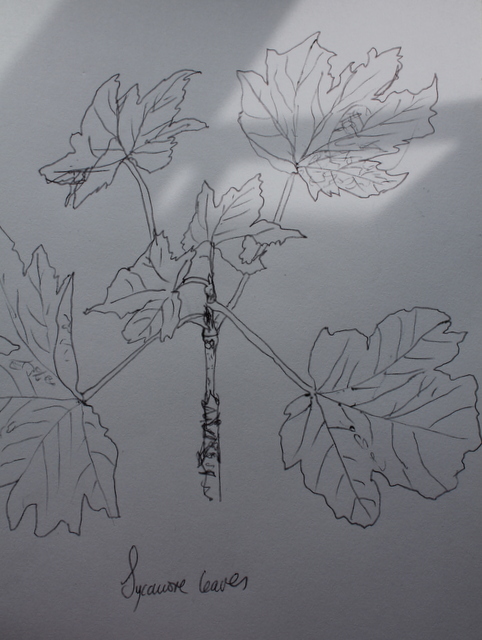 I concentrated on the large sycamore outside the house and did some basic sketches of the shapes. The sycamore is a tall branching solid tree with a knarled bark, appearing as though layers have been poured one on the other, the branches are long and irregular in shape ending in twisted small twigs. The leaves grow from all terminal branches, originating opposite each other, they are flat almost hand shaped having five lobes and sway in the wind in a more composite manner than the feathery smaller leaves of the taller thinner birch or silver birch. The sycamore is solid and knarled, the old man of the garden. I like this more detailed image of the trunk. The light altered as I drew and the daplled areas moved. The pencil became blunt-a recurring problem! 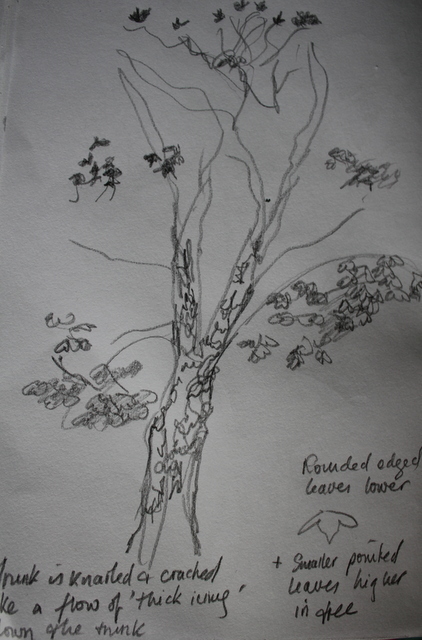 This has captured the knarled feel of the sycamore. By virtue of its low and heavy branches and thick foliage, it appears short and squat despite being one of the tallest trees. This image could relate to the annual rings of a tree trunk as well as water or even the microscopic appearance of bark in its rising and falling layers. I think it could be worked upon using different media to produce a similar feel to the pictures above done by Sandra Cinto but perhaps the sycamore being solid and knarled is not the best subject. This particular image was provoked by looking at the images of Kaoru Arima (ref: (Vitamin D New Perspectives in Drawing Phaidon Press ISBN 978 0 7148 4545 6) who draws “fragile line” drawings with deeper meanings. The drawing above represented the descending aorta with its ramifications –a pathology book helped to depict atheroma (which is the narrowing of the artery by the hard bark like lines in its inside —is this a too blatant a connection between thought and art? 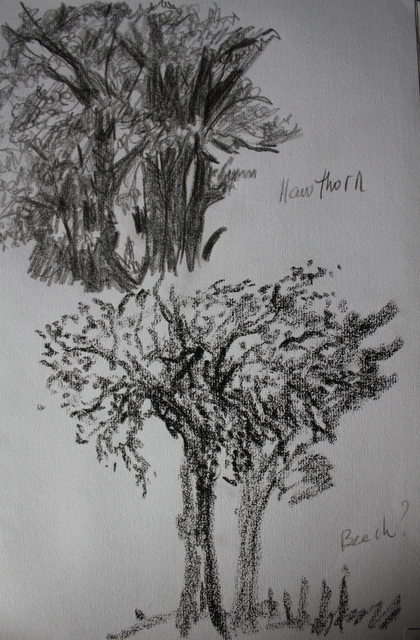 The hawthorn is one of my favourite trees -small very twisted and knarled and prickly and not really going anywhere and with beautiful flowers in Spring –this image does not do it justice, partly because of the choice of tree. 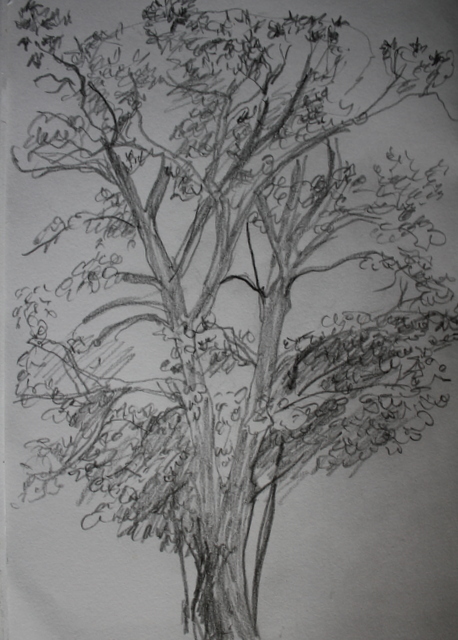 The beech, tall and thin with a smooth bark with foliage (in this particular tree) only in its upper quarter is not well drawn in the thick conte crayon and gives no feel of its tall aloofness and dancing leaves which remind me of a slender ballet dancer. 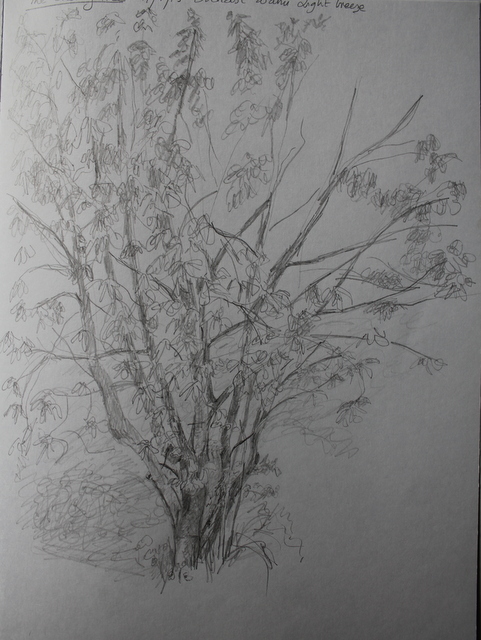 The Hazel tree: It was so hot drawing this tree that although there was a feint breeze rippling the feathery leaves I had to abandon. The notes on the image read: fast free flowing hand. Distinctiveness -tall and straight small leaves which “jiggle” rather than “wave ” like the sycamore’s leaves. Conical in shape. Very hot sun almost directly above 13:00hrs 13/7. Bored and “Rubbish”-demark the lower left edge. (It was too hot and I couldn’t see the foliage through the beads of sweat). 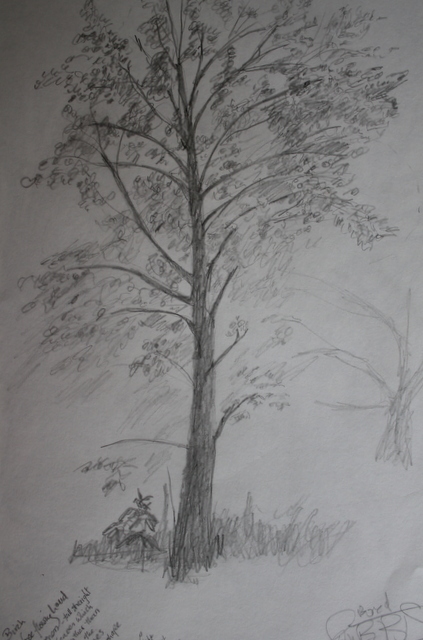 “Sitting in the orchard” this drawing took 1.5 hours and was done in the shade with light catching areas in the near and mid ground. It was started at 15:30 hrs. I love the drawing, the dominant foreground, the confusion of the mid and background and the hint of colour in the form of coloured pencils. 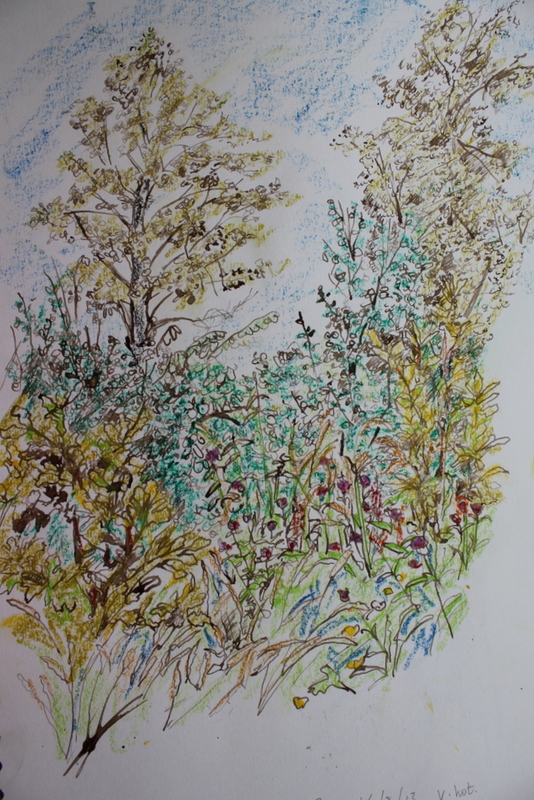 and then to “the young woodland” This was drawn in brown ink with a fine nib pen and areas of colour were added with oil pastels :It was again very hot and in direct sunlight. I love the confusion of lines and marks as the grasses give way to the small trees in the background. Small oaks frame the image and the purple of the thistles catch the eye in the mid and fore ground, otherwise there are no points of interest and I like that sensation. I didn’t originally like the colours-whilst I was sitting drawing the oil pastels were melting and not easy to handle and the colours were not to my liking but I think it holds well together and am quite pleased with the image. I love the contrast between the dark solid tree and the white flowers, the hint of trees in the background, the activity of the smaller branches and the way the light catches branches and flowers from the left. This watercolour is delicate and intricate, technically wonderful and in itself calm and appreciative of the simple subject of the tree trunk and many of this artists have this Oriental depth of feeling.